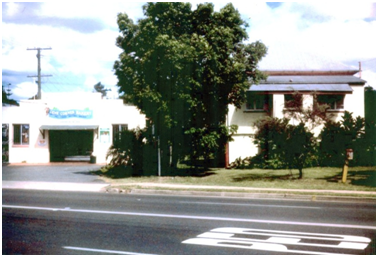 A boarding house, constructed during the early 20th century, originally occupied a site on Anzac Avenue near the northern corner of the Young Street intersection. Susannah King (1859-1940), the wife of Alf King the Petrie butcher, took over management of the boarding house around 1915. According to the reminiscences of Gladys Kretschmann, a grand-daughter of the Kings, there was a shop in the front selling groceries and sweets and the rooms were at the back. There were only three or four boarders at a time, mostly men working on the North Coast Railway. This property, which included three adjoining vacant allotments (Resubs. 19-21), was purchased by Arthur Edward Willmer (1878-1969) around 1920. The Willmers took over the former North Pine Boarding House and converted it into a family home, utilising the back rooms as their bedrooms. Attached to the rear of the building, separated by a narrow boardwalk, was the kitchen and a small storeroom. It wasn’t long before Arthur and his wife, Florence Eveline (nee Negus), converted the front entrance section into a shop selling fruit and vegetables and pastry items such as meat pies, fruit scones, pumpkin scones and jam tarts. The shop became very popular, especially on dance nights at the neighbouring North Pine School of Arts, when “everybody wanted their pie and peas, four pence each”. 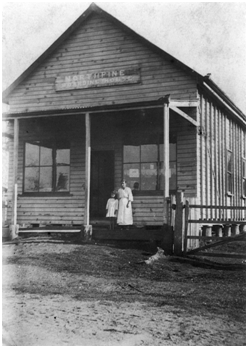 North Pine Boarding House, ca. 1920. Arthur Willmer demolished the boarding house around 1934, using the timber to build homes on two of the allotments. The third allotment, Resub. 21 on the corner of Young Street, had been sold in 1932 to Percy Frost, a Redcliffe baker, to permit the construction of a bakery. This was a fibro building which was later bricked in at the back. After several changes in ownership, it was taken over by Bernard Joseph Curtin, a baker who had arrived in Petrie during the late 1940s. The dough was mixed by hand, first in bins, then later in tumblers. Three men worked through the early hours of the morning and local residents recall that the bakery was fined on many occasions for Sunday trading. Gens Corner Bakery and one of the homes constructed around 1930 by the Willmer family, 2004. The bakery continued to operate at this site for nearly 75 years. The building, which had been modified many times, was finally demolished during mid 2006 to make way for the existing commercial development. Eric Willmer, My Memoirs, unpublished manuscript held in the Local History Collection, Moreton Bay Region Libraries, 2005.